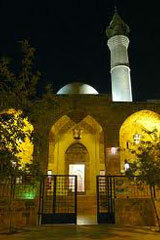 Amir Assaf Mosque, also called Babe al-Saraya Mosque was built by Emir Mansour Assaf between 1572 and 1580 on the site of the Byzantine Church of the Holy Savior. It is also called "Bab Al-Saray Mosque" meaning "Door of the Great Serial". Scholars disagree regarding the reason for the mosque's second name, some say it is referring to the Ottoman Grand Serail while others insist that it's referring to "Dar Al-Wilaya", an ancient government serail near the mosque that was built by Prince Fakhr-al-Din II, governor of Beirut and Mount Lebanon.